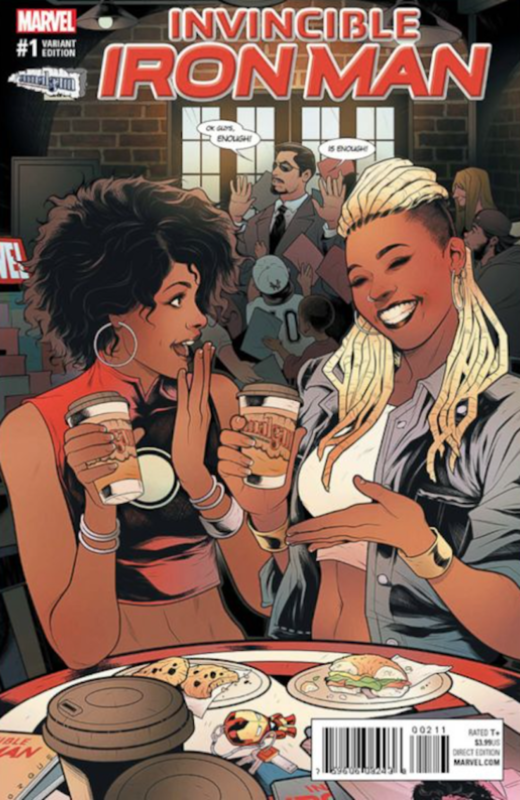 Riri Williams wants to introduce you to Ariell Johnson. She's the first black woman to own a comic book shop on the East Coast. Not only is she breaking ground up in Philly running her shop like a boss, but she just hopped on a variant cover, too! Plus, it's just any cover, fam, it's that brand new Riri. Here's one of the variants for Invincible Iron Man #1. According to ABC News, Ariell got the alley-oop from Randy Green, who brought the idea to life. She said, "When the email went out about potential variants for stores, he was really excited and took it upon himself to work out the [details]...I knew what it was supposed to look like, but having the actual art in front of you is so much different. It's really exciting." Johnson opened Amalgam Comics back in December and the community lifted her up to vitality. All of her hard work nurturing her business has now paid off even more. Not just anybody can say that they've graced the cover with one of our heroes. Seeing Ariell on that variant cover with the teen genius-turned-Iron-Heart Riri Williams is #blackgirlmagic at its best. Do yourself a favor and get to the comic book shop quick when this book drops in November. I have a distinct feeling that this cover won't last long on the shelves. Want more posts by Ira Hobbs? Sign up for Blavity's daily newsletter.